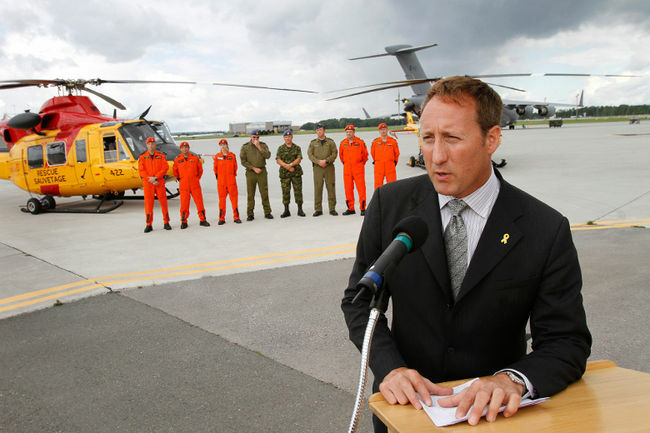 Some things have become clear in the past week with regards to the helicopter flight Defence Minister Peter MacKay took in July 2010. MacKay was on a fishing vacation in Newfoundland outside of Gander and one morning he found out he was needed in Ontario by noon to assist with a government announcement. Rather than take a 90 minute boat ride back to the Gander airport and risk missing his flight, MacKay commandeered a military search-and-rescue helicopter (the kind on standby to typically save fisherman from drowning in the North Atlantic) to pick him up from the remote fishing village he was in to shuttle him to the airport in a quarter of the time. MacKay attempted to orchestrate it so that the helicopter trip looked as though it was planned as part of his observing how search-and-rescue operations are undertaken on the island. This much we know. But we know more. Much more. We also know that the Toronto Star filed an access-to-information request to view military e-mails which showed not only that MacKay’s version of events was deeply flawed, but that then-Col. Bruce Ploughman, director of the Combined Aerospace Operations Centre in Winnipeg, warned the Minister against the action. But MacKay went ahead with the helicopter ride anyway. And when, in fact, the truth about the events was revealed, and both MacKay and Prime Minister Stephen Harper were pressed in the media and the House of Commons, both have flatly denied any wrong-doing. What’s more, they have consistently denied that the information contained in the military e-mails is even accurate, despite it’s being obtained through an access-to-information request. The Ottawa Citizen notes that the “cover up” from the Department of National Defence and the Canadian Forces is ultimately a “self-defeating strategy,” as these – albeit petty – infractions seem all the more sinister for the cover up. And therein lies the crux of the issue. People understand Minister’s sometimes needing to take advantage of their position for small issues, and a $16,000 helicopter ride, while not recommended, is relatively small potatoes. And mercifully, no fisherman drowned as a result of the helicopter being out of commission. But what people don’t understand, and have an even harder time forgiving, is the need to cover up, to deny, to misdirect and mislead (Parliament, the people’s house, no less). He lied. There. MacKay, in pushing an alternative version of reality we all know to be untrue, is lying to Parliament, the media, the Canadian people. And the obstinacy of the Minister and his Prime Minister to acknowledge any wrong-doing, let alone atone for it, strikes many in the opposition as arrogant and contemplative of the public and their honest obligations to that public. They again maintain he was on government business. Next question. But we all know how this story ends. Harper and the Conservative government have long used a two-pronged approach to wrong-doing on their part: either they resort to litigation (or the threat of litigation), or they frustrate the political opposition by simply waiting the media out. Another story will come along to replace the current furor over the MacKay scandal, and the media will move on to another issue of more topical interest. The opposition will temporarily fume before they too move on to bigger and better things. And the government breathes a sigh of relief. But I don’t know whether they are even holding their breath, as they know as well as we all do that MacKay will not see any reprimand for his actions. Admittedly, this is not the most egregious misappropriation of government resources I have ever heard a Minister being accused of, but still – misleading parliament sets a terrible precedent for a Minister to know they can elude punishment for misdeeds provided the man in the PMO supports them, and he almost always does. MacKay deserves some punishment for his actions, and while his resignation may be severe, if there is no other penalty, he should resign. Which he won’t. So Harper should demote him. Which he won’t. The Citizen is spot on when they note that “misleading Parliament is no big deal for this cabinet,” and they point to several recent examples of Tory malfeasance to prove their point. Bev Oda, the cabinet minister who comically inserted “not” into a document her ministry had already signed off on in order to deny funding to a charitable group unfavoured by the government comes to mind. As does Tony Clement’s misappropriation of $50M in “legacy funding” for G8 projects completed in his Huntsville riding during the G8/G20 summit in the summer of 2010. While downtown Toronto was trashed and looted, it was left with nothing to clean up damages or build “legacy” projects. Lying to Parliament is an assault on democracy…the issue is honesty, and the ethical code that the prime minister has a duty to establish in his cabinet. If a government can and will lie about little things, it can and will lie about big things.